Easily one of Grouch's dopest albums and most recognizable, here he delves into getting more musical with his production while still maintaining his signature honest, everyday raps. Fans take note, you must have this album in your collection! Features one of his most requested songs of all time...'Simple Man'. A song so popular it has even spawned t-shirts and hoodies...he even named his new record label after it. All Tracks produced by The Grouch except 3 and 12 by Grouch and Stu 'My Dad' Blank. 11 by Slurface and Lenny. Take it from a fan that owns every album by The Grouch, and a slew of others by his peers from the Living Legends collective - THIS CD IS A MUST OWN! The Living Legends are known for their uncanny sense of introspection and limitless amount of independence. They are arguably the truest of any underground hip-hop collective that exists today. 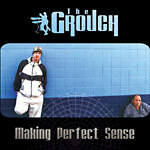 The Grouch takes all these descriptive terms to new heights on "Making Perfect Sense". His lyrics and flow have reached a whole new level of self-analysis and consciousness. The production and engineering are incomparable to his past works. But most of all, the way he balances all these elements are unrivaled by his peers. The Grouch represents what hip-hop is all about - THE STRUGGLE. Anyone can identify with The Grouch's struggles in living his life. Any listener can feel deep empathy on most of the subjects he brings forth. The Grouch does not make fluffy music of positivity. This is an album, that if you throw it in at a time when you yourself are "struggling", will shine light on the way that you are feeling, and ultimately makes you look at your situation in a completely different way. This is the soundtrack to real life. He builds on a variety of subject matter that can be taken to heart by any one person in a unique fashion. I feel that "Struggle Baby" represents The Grouch at his most introspective. The chilling personal tales, and the tranquil beats makes capturing your ears and mind a cinch for The Grouch. The same could be said about a number of tracks on this album. Overall, if you are looking for some real life material, look no further. I've listened to this album close to 50 times, and I'm sure I'll listen to it another 50 and beyond. It will always be one of my favorite albums of any genre. Coming from a true hip-hop head and owner of 600+ hip-hop albums, I hope that means something to the undecided buyer.